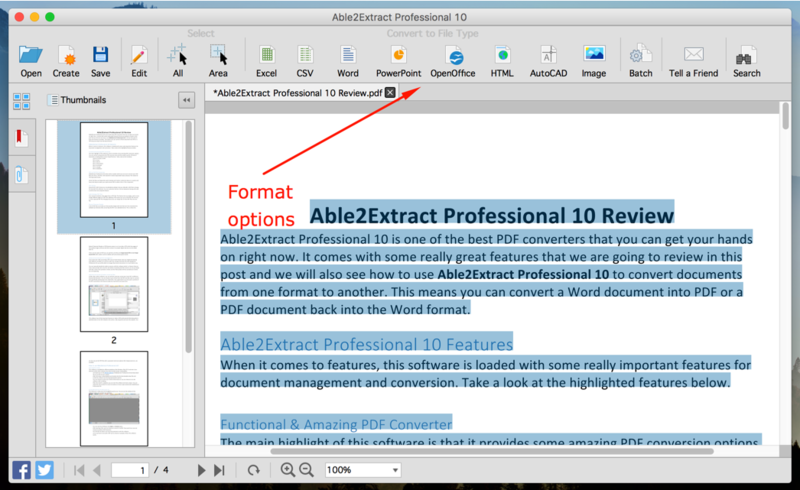 Able2Extract Professional 10 is one of the best PDF converters that you can get your hands on right now. It comes with some great features that we are going to review in this post, and we will also see how to use Able2Extract Professional 10 to convert documents from one format to another. When it comes to features, this software is loaded with some vital features for document management and conversion. Take a look at the highlighted features below. The main highlight of this software is that it provides some incredible PDF conversion options. You can convert a document to PDF and vice versa, and this stands true for all kinds of documents including Word, Excel, PowerPoint, etc. Take a look at the list below. 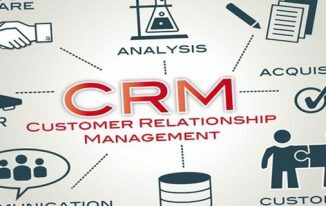 CSV & TSV files are frequently used to backup and restore numerical values in a system and hence the feature where you could convert PDF to either CSV or TSV is important. 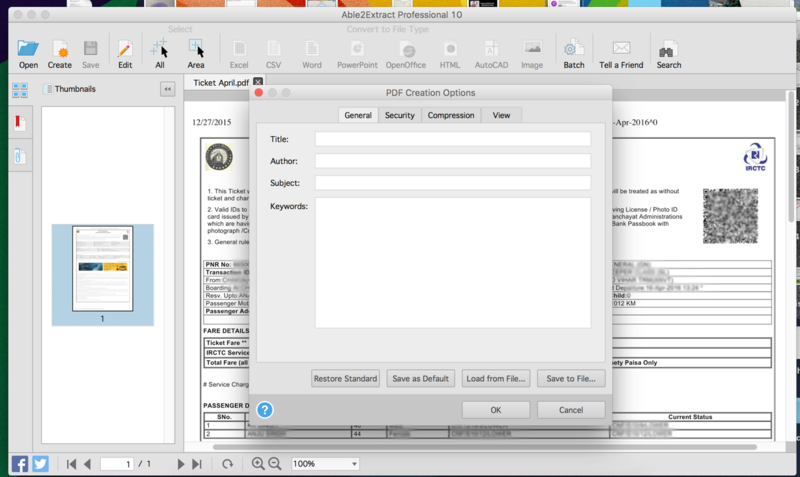 Able2Extract Professional 10 comes with an option that you can use to convert your PDF files into CSV or TSV files. CSV stands for Comma Separated Values whereas TSV stands for Tab Separated Values. Documents in PDF format are not editable by default. 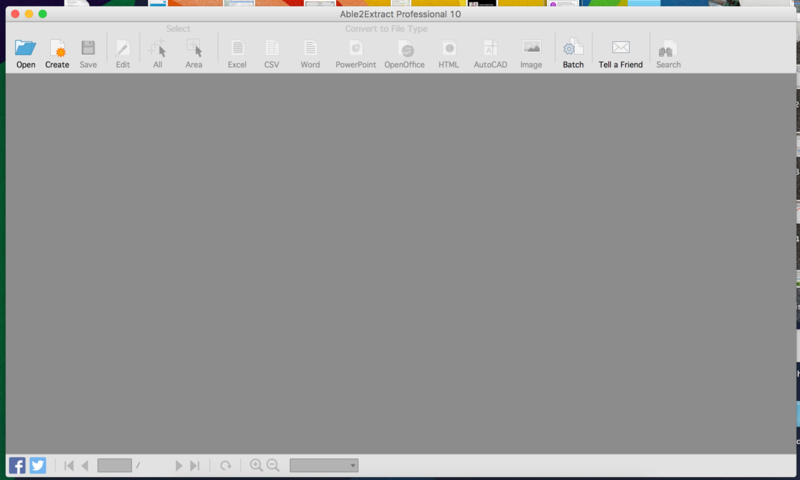 But you can edit a PDF file to change the text with this software. You can customize the font, the text placement along with color as well as font size using this feature. Ever wanted to delete a few pages from a PDF file? This feature lets you delete, split or even merge different pages of a PDF file. 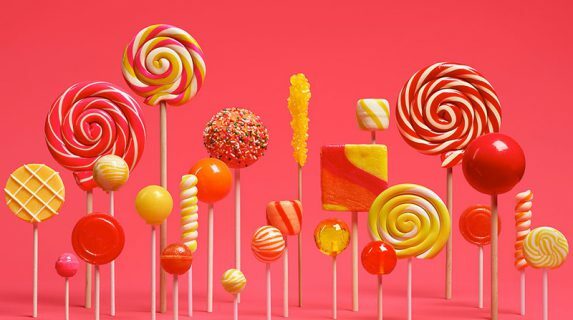 A lot of PDF files are made up of low-quality images with text that can’t be converted into editable text directly while converting the PDF to an editable format. This is where the Optical Character Reader or OCR feature comes in as it can take a PDF that has pages of low-quality images with text and then convert it to proper digital text that can be edited later on. Able2Extract 10 comes with a lot improved OCR engine so that you can work accurately with the scanned content. If you have ever tried converting a PDF into an Excel format, then you might be knowing how difficult it is to convert a PDF into a proper Excel file. But with Able2Extract Professional 10, you will be able to manage these Excel conversions in a much better way. You can manually handle the table structures with this software that is a feature that not many tools provide. Not only that but before converting the PDF to Excel, you can go ahead and take a look at the preview to make sure the final product will be similar to what you are expecting. 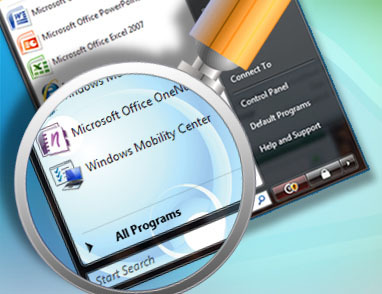 Unlike other similar software, you can perform selective conversions from PDF to different formats like Word, Excel, etc. You can choose a part of the text from the PDF and then, later on, convert that specifically selected part into a Word file. This is good when you only want a portion of the PDF converted as this feature makes the task faster and saves time. This software has all the essential features to make a PDF professionally like being able to add Metadata in the PDF related to the author, title, keywords and even the subjects. You can also secure the PDF files with a password and more options like Compression etc. are available. How to use Able2Extract Professional 10? 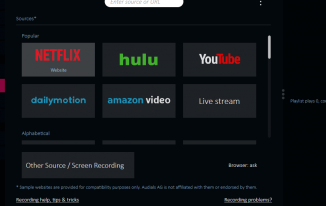 This software is available for different platforms like Windows, Mac OS X and even Linux (Ubuntu), unlike other software that have limited system compatibility. Just head over to the official website of Able2Extract Professional 10 and download the setup file for your system. Then, just double click the setup file and install the software by choosing appropriate options. You can opt to enter your license key (for the paid version). The software is easy and straightforward to use. You can see the window of the software with a very simple user interface. After opening a file, you can choose to convert it to PDF if you want to, or you can elect to perform OCR functions. You will also be able to set security parameters with this software. Let us see how to text edit a PDF just to check an example of how this software works. 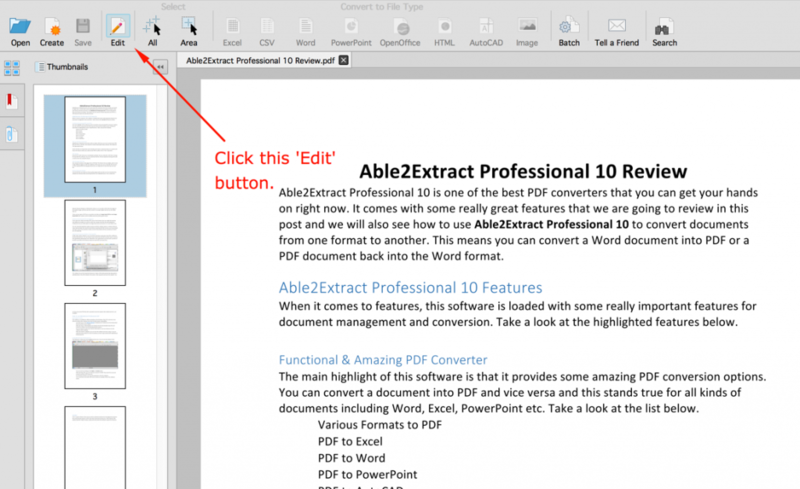 To edit text in an existing PDF file, you need to open that PDF file with Able2Extract. After opening it, you will see an edit option on the top tools bar. Click on that Edit button. You will notice that a new set of options will pop up which you will be able to use to edit the text. The format & font of text will be identified automatically so you don’t need to mess with font options at all. You can also convert the PDF to different formats by selecting the text you want to convert and then choosing the document format you want the PDF to be converted in. Able2Extract is an excellent software that can be used for professional document management purposes like converting documents to PDF from other document formats etc. Other features like optical character reader function well. Heartiest congratulations to all the winners! 🙂 We have emailed you the keys, please check your inbox. The Able2Extract Professional 10 giveaway will end on 14th January 2016 and the 3 lucky winners will be contacted on or before 20th January 2016. 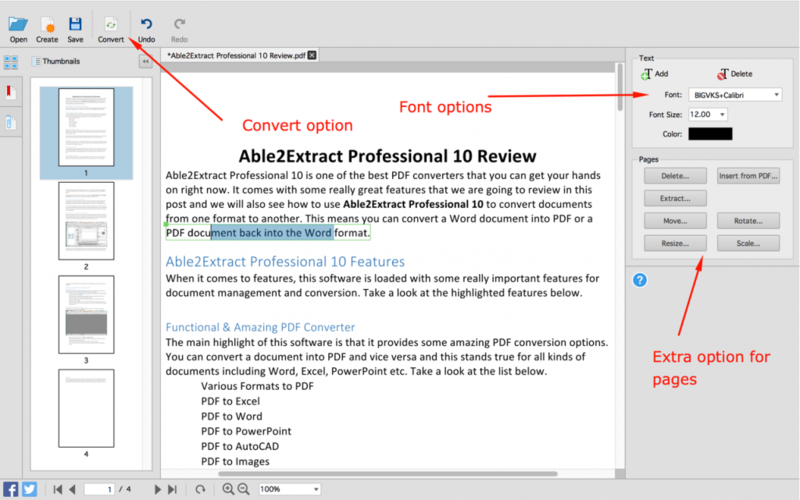 Awesome review and giveaway of one of the best PDF converters Able2Extract Professional 10 . It’s really an awesome review and contest! Thanks a lot! When the winners be announced ? It is written at the end itself. Who are the winners please? It will be announced soon. Please read the post, in that we have mentioned the date of announcement. Please have patience. Thanks for contacting us. I hope you haven’t read the post today. As it was said that before or on 20th, then you should have waited till 20th to see the results. Winners are announced already, and they were emailed as well with the prize.